"I doubt Kirby thought Ben was Jewish when the character was created, but as years went by and he put more of his own personality and personal background into the Thing, the idea that he’s Jewish isn’t that big of a leap of faith." Karl, thank you so much for agreeing to answer some questions. You seem to have been the “go to" guy for around ten years when there were gaps between writing teams, scripting odd issues here and there, and finishing off volume four. It always surprised me that no one ever decided to give you the job as a permanent fixture. Were there reasons why this didn’t come about? The answer’s simple: TIMING. It never worked out that they were looking for a regular writer when I would have been the best, most commercial choice. As you know, the FF struggled to find an audience. Because of that, writers had to be chosen who would create buzz and attract readers. The high point in my fan-popularity was, unfortunately, when the FF were handed off to the Image guys for “Heroes Reborn.” By the time of “Heroes Return” my star had lost enough luster that I didn’t get the gig. Quite honestly, it’s hard for me to argue with any of the choices since— they were all very talented, very popular writers. I think I may have been able to write the FF just as well as some of them (although nowhere near as well as, say, Waid or Hickman) but my name on the book at those points wouldn’t have helped sales. After a writing credit on the 1998 annual, your first credit on the title itself was writing the dialogue for a Pacheco-Marin plot. Tom Breevort is on record as saying that Pacheco desperately wanted to write as well as plot the issues, but his English wasn’t deemed good enough. How did such an arrangement work out? I got the plots and pencils, looked both over, then wrote dialogue that merged the two as best as possible. It wasn’t a difficult assignment at all, with a surprising amount of room for personal touches and expression. 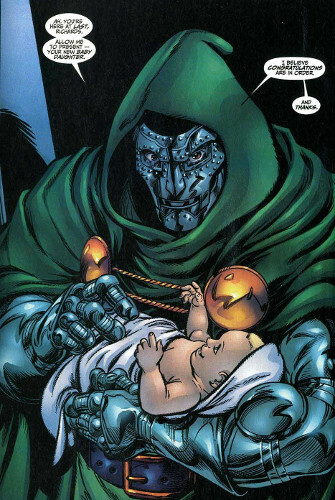 I remember being particularly happy with how Dr. Doom came out. Everything he said was so condescending! You had a co-writing assignment with Mark Waid on a Frightful Four story in 2004. How does the experience differ writing with someone else? Bottom line: Mark pulled me up a level, if not two. The story itself was one I’d wanted to do for a long time, but Mark taught me a couple tricks— specifically about how to surprise readers— that has stayed with me since. On the other hand, I’d like to think as the first person to read Mark’s work on those issues, I had fresh eyes and saw a couple places to tighten up the story that I think helped make it better. I saw you mention that your first-ever issue as a fan of the book was #81, where the Wizard was still a serious threat, and single-handedly took on the Fantastic Four. In later years he became more of a lower-tier villain, and the Frightful Four more comedic characters. The Dysfunctional storyline seems to restore the group to the threat they used to be, as well as updating them for a more technological age. Was this something you’d sought to do intentionally? Yes. I had long wanted to make the Frightfuls a true dark reflection of the FF. They’d always been one conceptionally, but I wanted it to be much more direct, with every relationship in the FF mirrored in the Frightfuls in some twisted, horrible way. The Wizard is revealed to have a daughter, Cole, but apart from a brief dream appearance, she doesn’t appear again. Did you have any further plans for where to take the character, and the Frightful Four? Sure. I would have loved (and would still love) to do more with my version of the Frightful Four. They’re the “there but for the grace of God go we” version of the Richards family. There’s tons of potential to mine there. 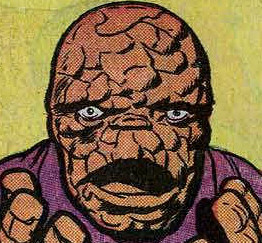 It's inevitable that the FF issue you’ll always be most known for is Remembrance of Things Past, a funny and poignant tale where the Thing finally reveals that he’s Jewish. How much editorial approval did you have to get to do this story, and what was the reaction in the industry? Tom Brevoort asked for single-issue pitches, but he didn’t want them to be filler— he wanted them to be consequential and worth reading. I remembered that Kirby had done a drawing of Ben in a yamika and prayer shawl, reminded Tom of it (he knew exactly what I was talking about, of course), and said “How about a story where we reveal Ben is Jewish?” Tom gave a quick thumbs up, and there was no editorial problems after that, that I remember. The biggest problem was finding the right villain for the story! I’d add that I doubt Kirby thought Ben was Jewish when the character was created, but as years went by and he put more of his own personality and personal background into the Thing, the idea that he’s Jewish isn’t that big of a leap of faith. So to speak. In addition to working on the core title, you’ve also done lots of extra titles with the characters, including a Human Torch mini-series, issues of Fantastic Four 2099 and the one-shot Death In The Family. Through them all your obvious love and understanding of the characters stands out. With many writers it’s clear which of the group is favoured, yet you seem to have got the voices and motivations of all four down perfectly. Was there any group member you preferred to develop more than any other? I love all four. Obviously. Ben is always a joy to work on. Johnny’s a bit trickier, only because his power is so naturally, easily destructive. One of the things I’ve tried to play up with Johnny, whenever possible, is that he’s a great cook! Makes sense— he has this intrinsic understanding of fire, right? That might be the sort of bit that gets lost in the continuity, but you never know. I was the first to put in a comic that Val was smarter than her dad, and that’s an intrinsic part of the family now. So you never know. And even when the FF book was cancelled, I suggested a series called Invisible, Inc. that would have Sue running a detective agency, with Reed poking his nose in all the time simply because he can’t help himself. 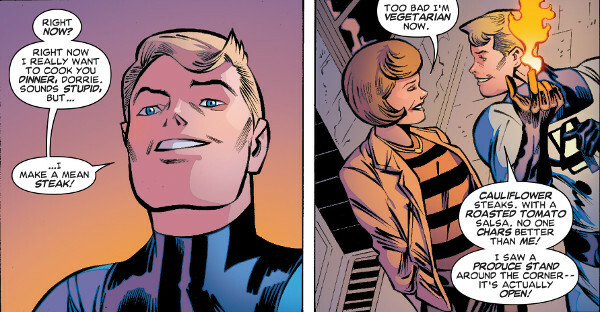 Very Nick and Nora Charles, except Sue in the Nick role and Reed in the Nora role. But Marvel had other plans. You’ve actually worked on the book more often as an inker, inking over 40 issues between 2002-2015, with the work of over half a dozen pencillers. How difficult is it to work to so many differing styles of art? Not difficult at all. Challenging and interesting is more like it. The trick is to capture in ink what you see in the pencils– which isn’t necessarily an easy trick. But it keeps life interesting. It sadly can’t be avoided that the title has struggled to find an audience over the last few years, and the reported sales figures for the book before it was cancelled were the lowest in its history. Why do you think the team aren’t connecting with modern audiences, and is it a problem that can be fixed? Everything goes in cycles. The FF started with arguably the strongest 100-issues of any comic ever, and had at least 3 other outstanding creative high points in its history. Given the right creative team, I have no doubt that they’d be setting the pace for the rest of the Marvel Universe once again. Lastly, if/when The Fantastic Four came back as a monthly comicbook, I’d love to see you get a shot at writing it as an ongoing gig. Would you take the opportunity if it came up? Is the Pope Catholic? If I got The Call, of course I’d write the ongoing series— or mini or single issue. I don’t think there’s a professional or serious FF fan out there who doesn’t know that about me. Not that I’m expecting that call, but if it came I’d be there. Because after so many years, the FF aren’t just my favorite characters— they’re family. And you’re always there for family.